I don’t know if any of you saw the advertising for it but last week I went to the very first ‘Universal Cookery and Food festival’ (I must admit I thought the use of the word Universal was a touch dramatic!). It was held in the beautiful grounds of Painshill Park, Cobham on a lovely autumn sunny day. It proudly boasted that it was organised by foodies for foodies and you could just tell that was the case as it was badly organised with presentations and demonstrations tripping over themselves however the day was packed with things us foodies love! There was a futuristic kitchen, craft demonstrations and presentation area where guest speakers dazzled us with their culinary knowledge. Earlier on in the year I wrote about the food trends for the year (I need to double check my predictions!) but what came out from this was the real juxtaposition between traditional skills being demonstrated by the cheese makers who showed us the whole process from milk to cracker and then talked about freeze drying ingredients to make soils and other edible wonders. 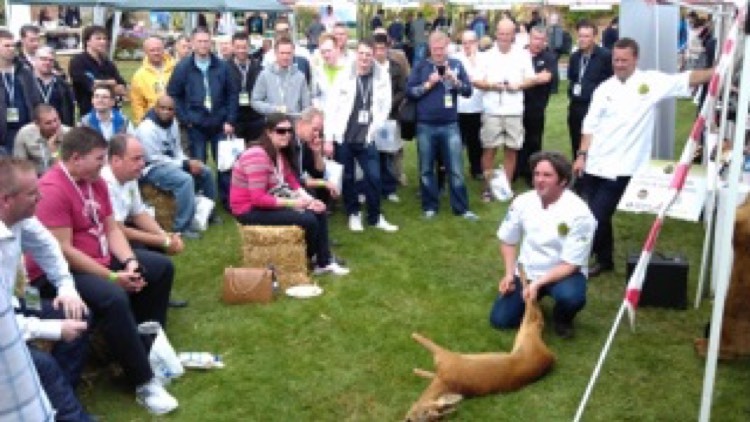 My favourite demonstration had to be the game butchery. Despite it not being very pleasant to watch I thought it was important as I always find seeing the process stops me being wasteful with something as precious as meat. I also loved the foraging tour and found it very enlightening, although I have come to the conclusion that just because something is edible doesn’t necessarily mean it’s delicious! We went through meadows to wooded areas and even to the lakeside to see what we could eat and some of it was a real revelation. There was one leaf we ate which is really plentiful and tasted just like the skin of a green apple, it was deliciously fresh and citrusy. I’m going to book him to take our chefs out for a walk as I know they’ll love it and if we’re clever enough we’ll be able to rustle up a bit of lunch. Next time I write I’ll talk a bit more about the butchery display, and if Im brave enough ill even add a photo or two that I took. I’d love to know your thoughts so please leave them in the box below!